I recently read an essay by Joseph Campbell describing the significance of Navaho sand painting in healing and other liminal moments in tribe member's lives. When the Dalai Lama visited UCSB a few Tibetan monks also created a sand mandala for the University. These art "works" mean so much more to cultures that devised them in an era before image saturation. Before photography or contemporary figurative painting when one person dared to attempt an image or symbol of a human it was akin to sacred magic. Also looking upon the images was said to have intense ramifications for the viewer. With all of this in mind how lucky I was to visit the Fowler Museum at UCLA to see the Early Aboriginal Icons of the Papunya exhibit. These images were true "Icons" in the most religious sense of the word, the symbols contained within are the most powerful and secret images for a culture that existed alone on a continent for thousands and thousands of years. At the entrance to the exhibit a sign warned patrons that the images are considered so holy by the indigenous peoples that viewing the paintings could have adverse psychological and emotional effects on viewers not initiated to their power. Consider yourself warned... they are stunning. I don't know the Navajo ones but I was very struck that the Tibetan Monks create this fabulous religious art and then destroy it. We are so attached to 'things' that this really made me think. These paintings are beautiful. Im an Aussie and I love Aboriginal culture, its so powerful and hidden. They are a unique people and the oldest native culture in any land on earth. It makes me sad to think that this sort of art and culture is not given the respect it deserves in its own country. You know when i went to school they did not teach ANY aboriginal history in our classes what so ever! Bu the history of white settlement was covered extensively. So sad! Nicola- that's amazing about how little aboriginal history is taught in AU. I went through public school in California and very little time was spent on Native Americans as well and when the indigenous people were referenced it was mostly in passing. 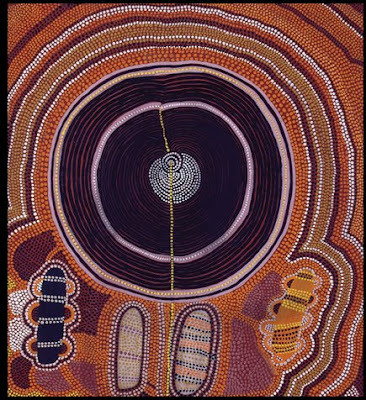 I love aboriginal art and really like wall paintings, dot works and snake paintings. Thank you Lauren for sharing this information post.